Who is Nesta of the Forest? Nesta was born Elsie Annie Elizabeth Ashton in Newport on 13 June 1893. In her 1939 book, Charmed Magic Casements: Clairvoyant Glimpses by Nesta of the Forest, she claims she made friends with fairies as a lonely child growing up in the Wye Valley. As an adult she was a psychic, medium, spiritualist, mental healer, psycho-analyst, and folklorist which led to her being summoned to appear in court by the city authorities following undercover investigations by the Gloucestershire Constabulary and was charged on two counts of “fortune telling to deceive and impose on His Majesty’s subjects.” In 1933 she was one of the last people in the country to be brought to court under the Witchcraft Act of 1735. While she lost her case, she was not burned as a witch, but rather, she was fined which at first she refused to pay, but relented on being told she would serve two weeks in prison unless she coughed up. Nesta cropped up again in 1960 when she was living in St Margaret’s Road, Cheltenham and this time her story made the national press. A couple employed by Nesta to do odd jobs were accused by her of stealing a garden spade. When they failed to return it she cast a spell on them by writing “They who steal a spade shall dig a grave for the one they love best” on three separate sheets of paper. One copy of the spell was posted to the couple, another buried in Nesta’s garden and the third burned. Within a short space of time the couple’s baby and the wife’s mother had died. We honor her memory today by writing it and reading it. By encouraging you to learn about her and the mindset that leads to a witch hunt, be in ancient times or a most decidedly modern one. 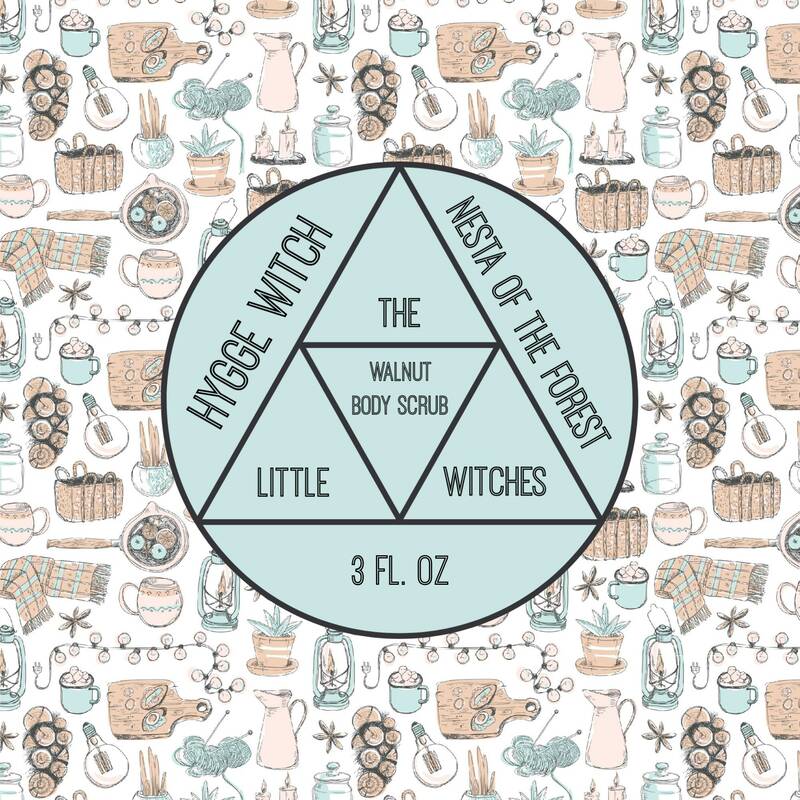 The scent I chose is Alpine Forest and it smells like: bergamot, eucalyptus, sparkling icicle, thyme, basil, iris, amber, cedarwood, and musk. 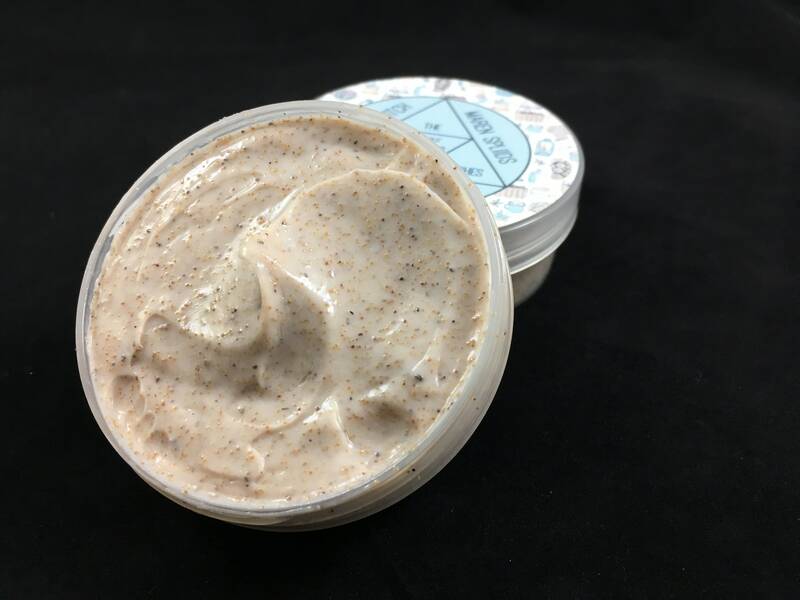 The scrub itself is paraben-free and free of mineral oil, and is a luxuriously thick and creamy textured body scrub base designed to help exfoliate the entire body, revealing a new layer of smooth, shiny, healthy skin. Every singe scoop of this scrub will gently remove dead skin cells and dirt, leaving the skin soft, cleansed, and hydrated. Suitable and ideal for dry and/or sensitive skin for all-over the body exfoliation. 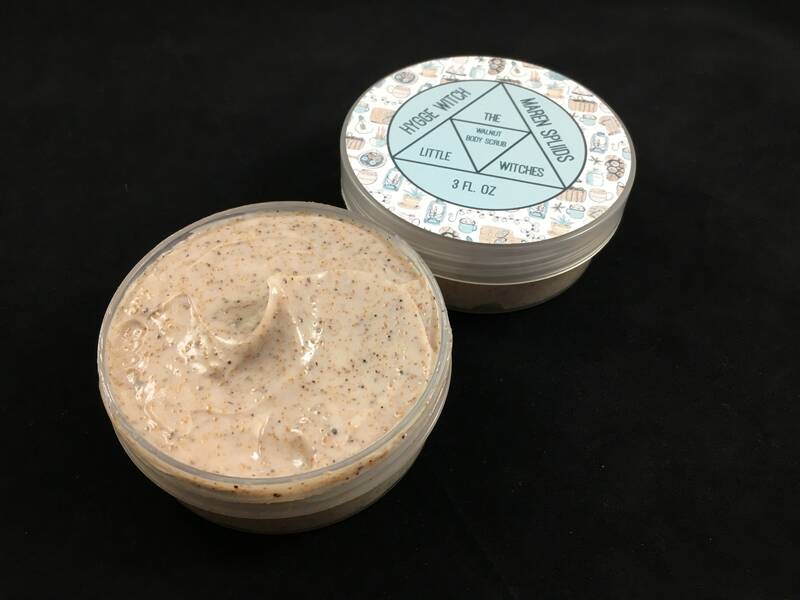 Full of natural oils and botanicals and crushed walnut leaving a perfect consistency - it's not too thick or too thin, it's not tacky, sticky or greasy. PS wondering what Hygge is? Hygge (pronounced hue-guh not hoo-gah) in essence means creating a warm atmosphere and enjoying the good things in life with good people. All of my products are created with that in mind. They are little labors of love that I create in my free time between running a mortuary that creates a good death and trying to create a good life with those that I love. I hope that anything you purchase from me can create some small feeling of joy or coziness. Naturally tan in color with a shelf life of 2 years. To make things easier all my lotions are now listed by Fluid Ounces rather than weight as their density varies. Each lotion comes in in a full 3 fluid ounce container. Ok so you keep referencing Hygge, what the heck is that?! First off it's pronounched Hoo-gah. The subtle pun here is "Hoo-gah Witch" say it quickly and you'll hear it. But don't hoo-gah them without consent. Hygge is the Danish art of "coziness". "It means creating a warm atmosphere and enjoying the good things in life with good people. The warm glow of candlelight is hygge. Cosying up with a loved one for a movie – that’s hygge, too. And there's nothing more hygge than sitting around with friends and family, discussing the big and small things in life. Perhaps hygge explains why the Danes are some of the happiest people in the world." You know what? Now that I read and write all this out, Hygge is kind of what being Death Positive personally means to me and that is probably why I was drawn to creating this series of comfort smells. 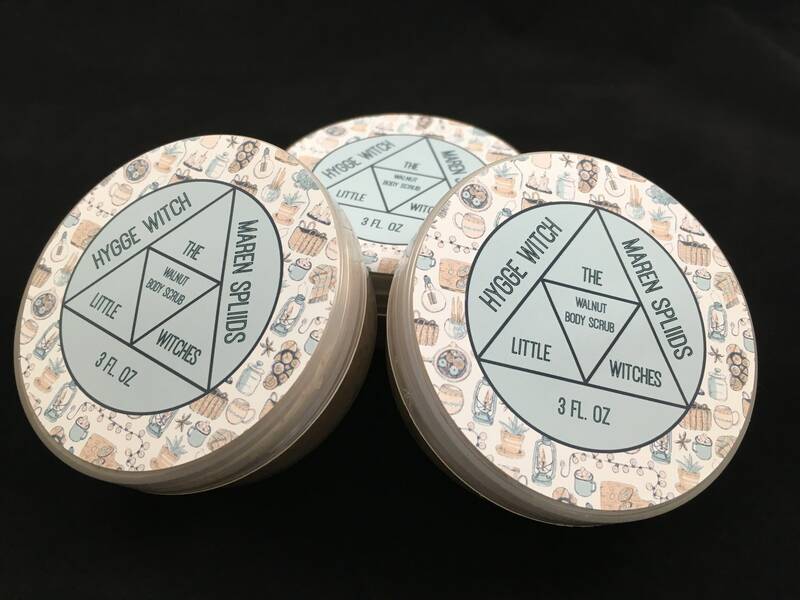 To be honest all my Easy Bake Coven scents give me the same warm fuzzies but who can resist that solid pun when making food smelling lotions? I encourage you to research Hygge and try practicing it in your own life. Deionized Water, Carthamus Tinctorius (Safflower) Seed Oil, Juglans Regia (Walnut) Shell Powder, TEA-Stearate, Glyceryl Stearate SE, Cetearyl Alcohol, Polysorbate 60, Glycerin, Butylene Glycol, Cetyl Alcohol, Tocopheryl Acetate (Vitamin E Acetate), Panthenol (Pro-Vitamin B5), Aloe Barbadensis (Aloe Vera) Leaf Extract, Calendula Officinalis Flower Extract, Chamomilla Recutita (Chamomile) Flower Extract, Symphytum Officinale Root Extract, Cucumis Sativus (Cucumber) Fruit Extract, Magnesium Aluminum Silicate, Phenoxyethanol, Ethylhexylglycerin, Caprylyl Glycol, Hexylene Glycol.